I’m Maurice Rissman of Raider Motorsport. I’ve been involved in bike and car racing my entire life as both a competitor and team owner. In 2003 I escaped Sydney to Coffs Harbor (about 7 hours ride north of Sydney) where I married and now live with my wife Jo, and our boys Jack and Ben. PB: Describe Raider Motorsport to us. MR: Raider Motorsport’s been around since the 70s and has been involved in almost every discipline of two and four wheel competition. Today we’re a rare and unique bike importer; things like Ducati, Guzzi, Bimota, Honda Fours, Z1 Kawakas and triples. 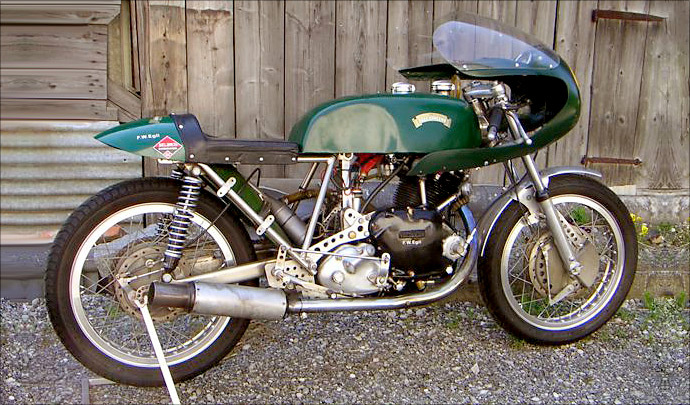 We also do top shelf stuff like Egli Vincent and the oval-pistoned Honda RC40. This year we’ve created our own range of retro racers, some of which have appeared on Pipeburn. We’ve kicked off with SR’s and GB’s, and we hope to soon have a reasonable range of models in various styles; Bobbers, Street Fighters and Café Racers etc. PB: You have an amazing history of working with racing cars and bikes – can you give us a brief overview? 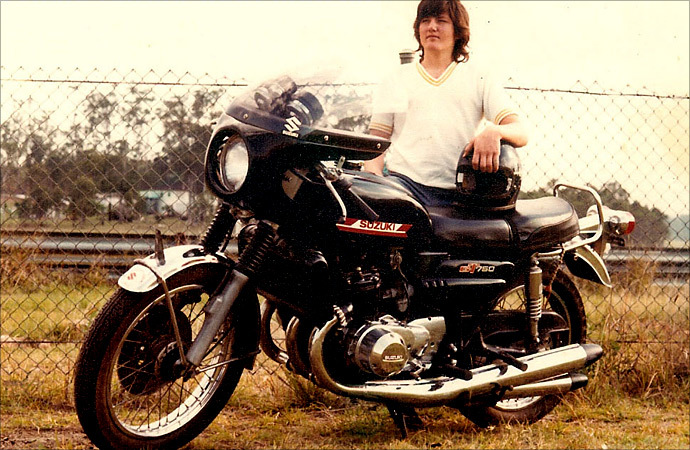 MR: I started racing dirt bikes at around 13 on an antique, pressed-metal frame, Suzuki 90cc road bike. Then I got into drag racing, then circuit racing; I didn’t have the bucks to just buy something good so I had to look for technical advantages. I broke national drag records twice with a bike I built under the house. I developed a reputation for thinking outside the square, which l gave me a foot in the door with some high-profile Oz teams. In the 80’s I worked for racing teams in the UK and Japan before returning home in 1989 to run a GM Holden open-wheel racing car category. PB: When did Raider get involved in bike racing? MR: In the mid 90’s I sponsored a Ducati 900S. The bike was supplied and supported by the Australian Ducati importer, NFI. We won our class, which was the world’s first win for that particular model, and as a consequence I became quite heavily involved with Ducati. After that event the team persuaded me to get a race license and before I knew it was on the grid. 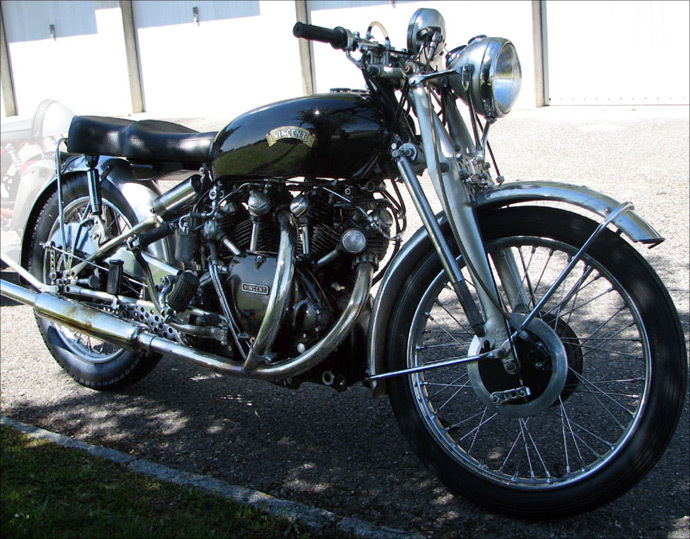 The Egli Vincent, which Maurice has kindly agreed to give to me for writing such an amazing article. Ahem. 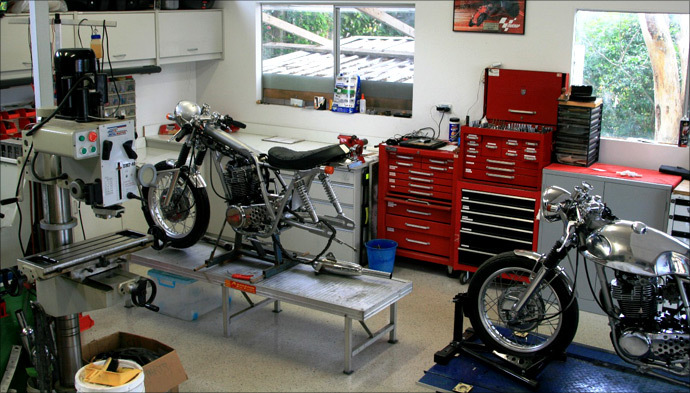 PB: So you import, service, restore AND customise bikes? And there are only two of you? How do you do that? MR: We’re kept busy that’s for sure. It helps that the operation is run from home. However, by far the greatest advantage lays with Mark Schadel, the other half of our two-man team. Mark is a spray painter by trade, but that pales into insignificance when compared to everything else he can do. Between the two of us we do everything in-house excluding sandblasting and powder coating, and I mean everything. PB: You guys seem to have a vast array of motorbikes in stock. How many do you currently have and how do you resist the temptation to just ride them all day? MR: Ha! We have over 100 bikes, and it’s our customers that ensure we don’t have that much time to sample them with any gusto. Having said that, I nicked off for a week recently taking a 999R for a 4 day tour of south-east Queensland with some fellow maniacs. We passed an unmarked cop at 180+kmh (110+mph) so I’m waiting nervously to see if I get a present in the mail. PB: Do you guys source bikes to order, or is it more “luck of the draw”? MR: Bit of both actually; many customers will give us a wish list, and we go find them. Other times we stumble across things and just grab them in the hope of finding a buyer. We also look for ‘sleepers’; bikes we believe are just being noticed by the collector market. 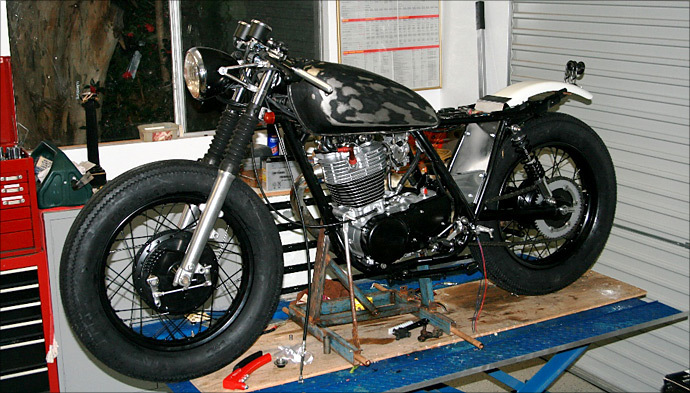 PB: A hypothetical: I’ve got $8k for a cafe racer project and a three-word brief, “black and badass”. One month later you pull the covers off my new bike – what do I see? MR: Traditionally café racer means lots of chrome – “black & badass” is a more latter-day incarnation of the genre. Maybe something based upon a GB500? We’d go low and lean, small rectangular tank, single seat, black engine with subtle chrome and polished alloy highlights, black wrapped headers, flat black custom made muffler. Big chunky tires, black rims with polished edges, a smiths Speedo and clip-ons, and everything else stripped off. Plain dark paint, and a pin stripe down the centre. PB: We got a great response to your Varkain SR400. How’d that project come about? MR: We had customer who wanted a Deus but couldn’t afford the ticket. He had a budget of $10k and a brief not dissimilar to your hypothetical above. We said it’d be tight but that we could do it, and we started building. After several broken deposit promises we figured he’d changed his mind, but we were getting into it so we kept going. In the end we blew the budget so he missed out on a real bargain. It’s had such a great response it’s now a Raider model. PB: You seem to have your hands on a LOT of cool machines. What’s yr all-time favourite motorbike? That’s tough given the many genera; in the vintage category it’s hard to go past either the Vincent Black Shadow and the Egli Vincent. Of the modern classic’s, the engineering difficulties Honda had to overcome in producing the RC40, with its oval pistons and rings, makes this one of the most spectacular bikes ever produced, let alone produced for road use. Of course, the Ducati Desmosedici would be up there as well. PB: What custom projects will we see next from you guys? PB: Where do you see Raider in 10 years time? 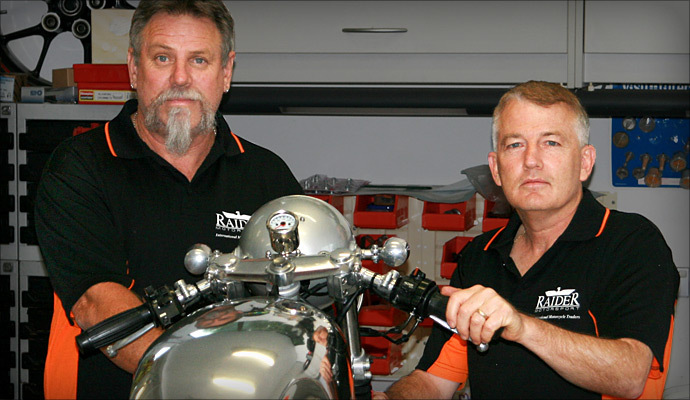 MR: We’re working towards building a motorcycle museum here in Coffs Harbour. It will have a theme café plus sales showroom for our own bikes. From inside the museum patrons will be able to watch bikes being restored via glass partitioning to a section of the workshop. Also, with two boys it’s quite possible that soon Raider will have returned to dirt bike racing. Mind you, it’s unlikely we’ll be using a pressed metal-framed old two-stroke road bike though, as we wouldn’t be able to risk something that valuable.